The third workout of the 2019 Reebok CrossFit Games Open was a chipper with dumbbell overhead lunges, dumbbell box step-ups, strict handstand push-ups, handstand walks, and a tight 10-minute time cap. This is the first time we’ve seen strict handstand push-ups in the Open. Despite the introduction of a new high-skill movement, an impressive 88,000 men and 25,000 women were able to perform at least one strict handstand push-up during 19.3. Even though strict handstand push-ups were featured in 19.3, fewer athletes decided to scale the workout compared to 19.2. This is likely due to the chipper format, which allowed athletes to perform quite a bit of work before facing the strict handstand push-ups. Among men 18 to 34, 88 percent performed the Rx'd version this week, compared to 94 percent for 19.1 and 80 percent for 19.2. Among women 18 to 34, we saw 71 percent perform the Rx'd version, compared to 57 percent for 19.1 and 83 percent for 19.2. Sixty percent of men 18 to 34 finished 19.3 on the strict handstand push-ups, while the largest group of women (35 percent) finished at the wall with 90 reps (zero strict handstand push-ups). In terms of strict handstand push-up ability, 64 percent of all men 18 to 34 and 24 percent of all women 18 to 34 were able to perform at least 1 rep. Breaking it down a little further, we can see a declining number of men and women at the higher rep ranges of strict handstand push-ups. Very few competitors were able to make it to the handstand walk portion of the workout (4 percent of men 18 to 34 and 2 percent of women in the same age group). At the beginning of the Open, we looked at the top 10 countries based on participation. This week we wanted to get an idea of how various countries stacked up against each other performance-wise. There are many ways to do this, but we are going to rank them based on 99th-percentile reps on 19.3 for both men and women (ages 18 to 34, stacking Rx’d scores ahead of scaled). We are limiting it just to the top 10 participating countries to keep the statistics in a comparable range. Below you can see the results. 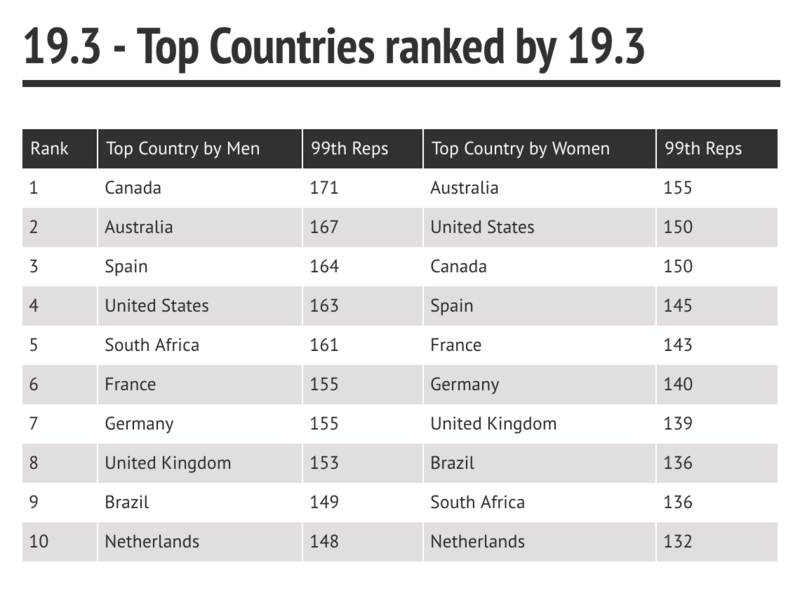 The top countries based on this analysis were Canada for men and Australia for women. 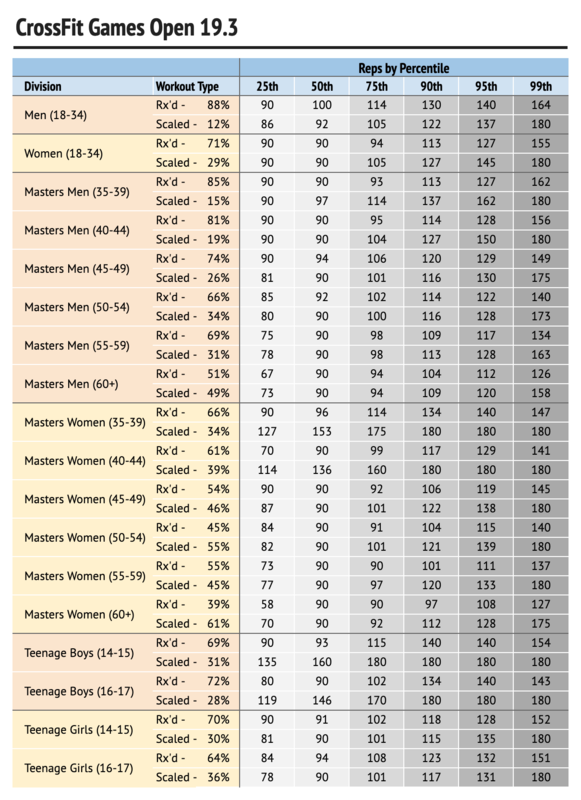 Below is the percentile table for all divisions. You can see the breakdown of how many reps it took to achieve a particular percentile. For example, for Rx’d Women 18-34, you needed a score of 94 reps to get into the 75th percentile. You can see the percentage of athletes who did the scaled version in each division as well. Note that these percentiles compare scores in the same version of the workout only, so they will differ from the Games app, which is a composite percentile including both Rx’d and scaled results in a particular division.